Staffordshire abbreviated Staffs is a landlocked county in the West Midlands of England. It adjoins the counties of Cheshire to the north-west, Derbyshire and Leicestershire to the west, Warwickshire to the south east, West Midlands and Worcestershire to the south and Shropshire to the west. Staffordshire’s largest city is Stoke-on-Trent which is administered separately from the rest of the county and Lichfield is a smaller cathedral city. Its county town is Stafford and other major towns include Burton upon Trent, Cannock, Newcastle-under-Lyme, Leek and Tamworth. In the north and in the south the county is hilly with wild moorlands. In the far north are the uplands of the Peak District and to the south Cannock Chase an Area of Outstanding Natural Beauty. The middle regions are low with a gradual rolling landscape and throughout the county there are vast and important coalfields. The county’s largest river is the Trent which rises north of Stoke then flows through Stone and Rugeley to leave at Burton. The River Dove which joins the Trent just north of Burton forms the boundary with Derbyshire. The town of Stafford sits on the River Sow which joins the Trent south east of the town. The village of Flash in the Staffordshire Moorlands is the highest village in Britain standing at 463 metres (1518 ft) above sea level and the highest point in Staffordshire is Cheeks Point on Cheeks Hill which forms part of the border between Derbyshire and Staffordshire. The Staffordshire bull terrier also known as staffs, staffies or nanny dogs was bread in this county for hunting purposes. Deep Hayes Country Park, on the edge of the Peak District, was created out of a disused quarry lying on the south side of the River Churnet valley. Covering 60 hectares it was the site of a large reservoir supplying drinking water to Stoke-on-Trent. The reservoir was reduced to three large scenic ponds which are surrounded by way-marked walks through picturesque woodland and flower rich meadows, which link to the adjacent Caldon Canal towpaths. There is an information centre and gift shop with disabled access, Public toilets with baby changing and disabled facilities. There are also light refreshments, picnic area and parking. Dogs on leads are allowed. Entry is free. Caldon Canal opened in 1779 to carry Peak District limestone from the quarries at Cauldon Low for the iron industry and flints for the pottery industry. A short branch was built 18 years later connecting the Caldon to the town of Leek. Another branch extended the navigation to Uttoxeter but was closed in 1845 and replace with a railway line. Soon after the building of a parallel railway line the canal became deserted of freight traffic and became almost un-navigable by the 1960’s. It was later restored and brought back into use in 1974. The first lock and basin at Froghall on the Uttoxeter branch of the canal have been restored and re-opened in 2005. The Leek branch has also undertaken restoration. The Caldon and Uttoxeter Canals Trust are working hard to preserve and restore these waterways. 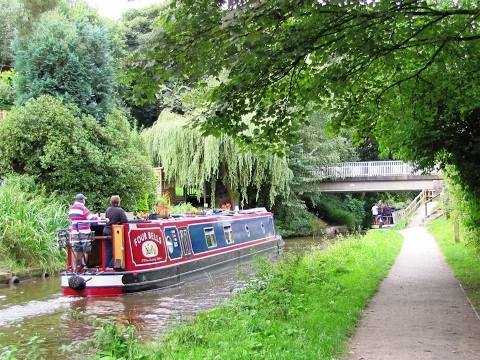 The canal with its outstanding scenery is steeped in history with much to see it is ideal for boaters, walkers, cyclists and tourists. Cheddleton lies in the Churnet valley where it deep and steep sided. There has been a settlement at Cheddleton since at least Saxon Times since the river was an obvious source of both water and water power. The village began to expand with the construction of the Caldon Canal in 1779. The canal brought improved communications and hence history, such as flint milling, to the area. The construction of the North Staffordshire Railway in 1849 brought further industry to the area which remains to-day. Cheddleton Station is the main centre for the Churnet Valley Railway an excellent tourist attraction. The village is also close to the southern end of the Peak District with the Roaches and Staffordshire Moorlands not far away. Cheddleton Flint Mill is a water mill situated in the village of Cheddleton. The mill race takes its water from the River Churnet and the site may have been used for milling since the Middle Ages but the present buildings date from the Industrial Revolution. There are actually two mills one was built to grind flint for use in the pottery industry and the other was built as a corn mill then converted to grind flint. The mill site which was listed Grade II in 1986 is located at the side of Caldon Canal and includes a miller’s cottage, two flint kilns, a drying kiln and outbuildings. It is now managed and run by the Cheddleton Flint Mill Industrial Heritage Trust. Stanley is a small village west of Cheddleton housing two pubs the Travellers Rest and the Rose and Crown. Close by is Stanley Pool which was constructed in 1786 as an 8 acre reservoir for the Caldon Canal. The reservoir was enlarged to 33 acres in 1840 when a new dam was built to the north. Today it is also used for sailing and fishing. Staffordshire Way is a 92 mile long distance footpath spanning the length of the county. It was created by Staffordshire County Council using existing rights of way and permissive paths and links with the Cheshire Grit stone Trail, the Heart of England Way and the North Worcestershire Path. Starting at Mow Cop Castle it passes through several interesting towns and villages and much of Staffordshire’s finest scenery before ending at the dramatic sandstone ridge of Kinver Edge. The route never far away from attractions and places to stay makes it an ideal path to walk in separate stages as well as those wishing to walk the whole route it in a week or so. We walk back out of the car park to the road and turn left to cross the bridge. At the end of the railings of the bridge we turn right down to Caldon Canal and follow the towpath with the canal on our right. When we reach Cheddleton Flint Mill we take a look around the buildings etc then leave the towpath to the left of the bridge to reach the main road. We turn right following the pavement uphill then opposite the Red Lion we turn right onto Hollow Lane. We follow the lane uphill past the Black Lion, the church and the school then continue straight forward onto Shaffalong Lane. We keep following the lane uphill to the top then downhill for a short way until the lane bends round to the left. We take the footpath over a stile in the hedge on the right. We head across the field to the bottom left corner and cross over a stile onto Coalpitford Lane. We follow the lane downhill cross over a bridge then head steeply uphill. At Colford Farm we turn left onto a track leading into Ford Farm. In the farmyard we turn right between the sheds to go through a gate into a field. We head forward through the fields to a lane. We turn left then at the junction we fork right onto another lane signposted Stanley. We follow the lane past the chapel and when the lane bends to the right we turn left onto a track in front of a farm. We continue straight ahead ignoring a turning off to the left to Bagnall Grange. We go through the farmyard and take the track on the right next to the last shed then follow this, Old Mill Lane, downhill to the stream at the bottom. We cross the stream and follow the track uphill with the hedge on our left until it turns left we turn right here across the field to go over a stile then continue in the same direction across the fields to arrive at Stanley Pool. We make our way across the end of the lake then follow the path uphill through the trees. At the end of the wood we cross a wooden bridge and turn left over a stile. We cross the field then half way along the next field we go over a stile by a gate then continue along the other side of the wall to the field corner. We cross a stile and continue behind house gardens then through a wall to cross a field to the road at Stanley. We turn right and follow the road to a track on the left signposted Little Acres Farm. We turn left here then soon turn right through a gate and follow the path half left across the field to go through another gate. We then follow the path downhill though the two fields and gates to a footbridge. We cross the bridge and bear left towards the big farm ahead. At the hedge and a gate we turn right over a stile and head forwards with the hedge on our left. We turn left through the second gate then bear half right to the left of the pylon and at large tree with an arrow on it we go over the stile on the right to the road. We turn left then right onto Little Hollinghurst Farm drive then immediate right over a stile. We cross the field to a stile to the right of a bungalow. We cross straight over the field then bear left through the next field to cross a stile. We bear right to a stile by an oak tree and continue to a stile and gate to the left of the farm buildings. We go over the stile and bear left downhill to pass through a gate and then across the two canal bridges. We turn left and left again to go under the bridge to join the towpath with the canal on our right. We continue on the towpath passing Hazelhurst Locks, Hazelhurst Aqueduct and the Holly Bush Inn until we arrive back at Bridge 39. We now make our way back up to Deep Hayes Country Park. This is an easy walk following the towpath at the side of the Caldon Canal. The rest of the walk is on minor tarmac road, tracks and paths through grass fields with gates, stiles and small footbridges. Approx 7.75 miles allow 3 – 4 hours using OS Explorer Map OL24, The Peak District, White Peak area. This walk is done clockwise. Start point: Deep Hayes Country Park car park. Deep Hayes Country Park is near Leek north east of Stoke-on-Trent in Staffordshire. From Buxton take the A53 passing through Leek. Continue on the A53 and at the crossroads with a minor road at Longsdon turn left to Horse Bridge. After crossing a bridge over the Caldon Canal, continue ahead to cross another bridge over the canal at a sharp bend, Deep Hayes Country Park is on the right. From Newcastle-under-Lyme take the A53 towards Leek. At the crossroads with a minor road at Longsdon turn right to Horse Bridge and continue as above. Parking: Deep Hayes Country Park free car park. There are public toilets in the car park at Deep Hayes Country Park. For refreshments there are four pubs on-route the Red Lion and Black Lion at Cheddleton, the Travellers Rest at Stanley and the Holly Bush Inn at the side of the canal close to the Hazelhurst Aqueduct.